Navarrete, F.; Botella, P.; Franch, X. Currently organizations tend to construct their Information Systems with components acquired or licensed from specific segments of the market. This is a growing trend in the industry because only a few companies have the resources to compete with the constant evolution of the market. On the other hand, the use of agile methods like eXtreme Programming (XP) within the development context has increased in the industry and the research community. There are several methods of selection within the COTS context that are either based on waterfall processes or iterative developments adapted to specific business contexts. Not much has been studied about the agility of the methods proposals to select and to integrate COTS to the system architecture or the possible extrapolation of the agile concepts to the COTS domain. This proposal aims in this direction. It tries to extrapolate the agile world concepts, such as agile values and agile principles, to the world of the COTS. 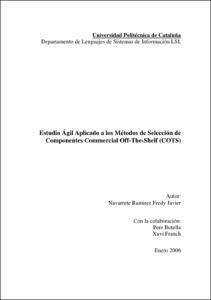 It is the starting point for a formal proposal of study of the agility within context COTS. Navarrete, F., Botella, P., Franch, X. "Estudio ágil aplicado a los métodos de selección de componentes commercial off-the-shelf (COTS)". 2006.